I found a device by Melixis the MLX90614 that on paper has 10 degrees FOV and a resolution of 0.02 degrees in it's measurements this on paper seems well able to detect breast cancer as the area with cancer has over 0.1degees diffrent. The MLX90614 is an Infra Red thermometer for non contact temperature measurements. 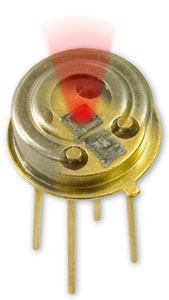 Both the IR sensitive thermopile detector chip and the signal conditioning ASIC are integrated in the same TO-39 can. Integrated into the MLX90614 are a low noise amplifier, 17-bit ADC and powerful DSP unit thus achieving high accuracy and resolution of the thermometer. The thermometer comes factory calibrated with a digital SMBus output giving full access to the measured temperature in the complete temperature range(s) with a resolution of 0.02°C.